The May 24 and 25 processions, the heart of the feast, fell on Wednesday and Thursday in 2017. Campers began arriving the weekend before. By Tuesday, 680 caravan campers were registered in town, and hotels were full. During these preparatory days, the church was open to receive visitors, and people stopped in all day to visit the church, particularly the crypt with the statue of Ste. Sara. 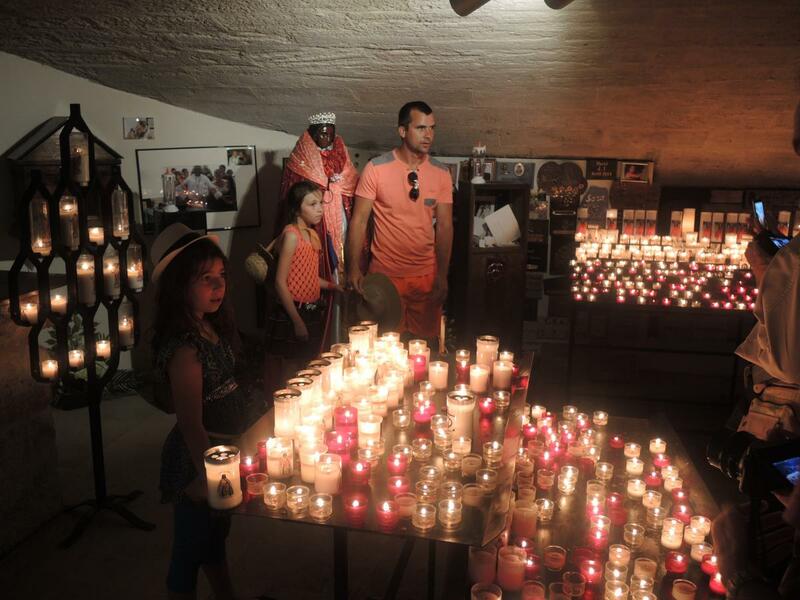 From the first days onward, the crypt was ablaze with devotional candles and ex-voto objects, as small groups of people arrived to visit and to take pictures with Ste. Sara, who was already covered in the layers of the brightly colored capes that serve as devotional offerings. Eventually they pile high enough to partially obscure her face. The Catholic chaplaincy to the Gypsies and Gens du Voyage organized the daily events, in collaboration with town officials and the parish. They met daily in a large room at the back of the town hall. 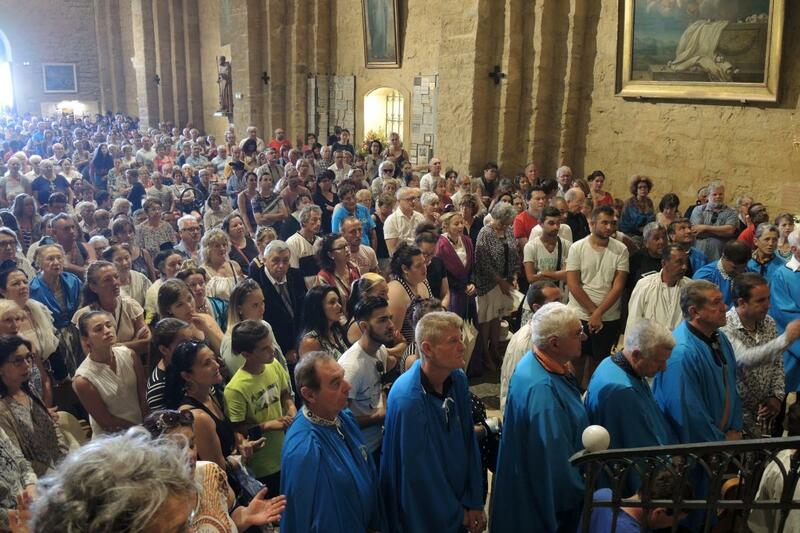 In addition to the daily Masses in the caravane parking areas, they sponsored prayer vigils for youth, for the sick, and in remembrance of the dead (signs for that indicated not only that they pray for the dead, but with them), catechism classes, visits to the high chapel that houses the relics of the Saintes Maries, youth meetings, and even a puppet show for children. On a number of days, the church was also a site for baptisms and weddings. Not far from the church, a large outdoor market in the Place des Gitans, Gypsy Plaza, was filled with tent-covered booths where goods were sold by and to the Gens du Voyage. A local exhibition center also hosted a variety of exhibits on the Gens du Voyage and their history at the feast. At various spots in plazas and around outdoor tables at restaurants, musicians occasionally played music and sang. Much of the socializing and music-making was in the caravan camps, after Mass or in the evening, to celebrate a family occasion, but for the most part those areas were remarkably quiet throughout.4 The biggest frenzy of activity was reserved for the moment when Sara’s procession reached the beach. May 25 is the feast of Ste. Marie Jacobé, but the activities honoring her and Ste. Sara begin on May 24. That morning, by 10 a.m. the church was crowded for Mass, with at least half of the seats in the choir and the nave reserved for Gens du Voyage. 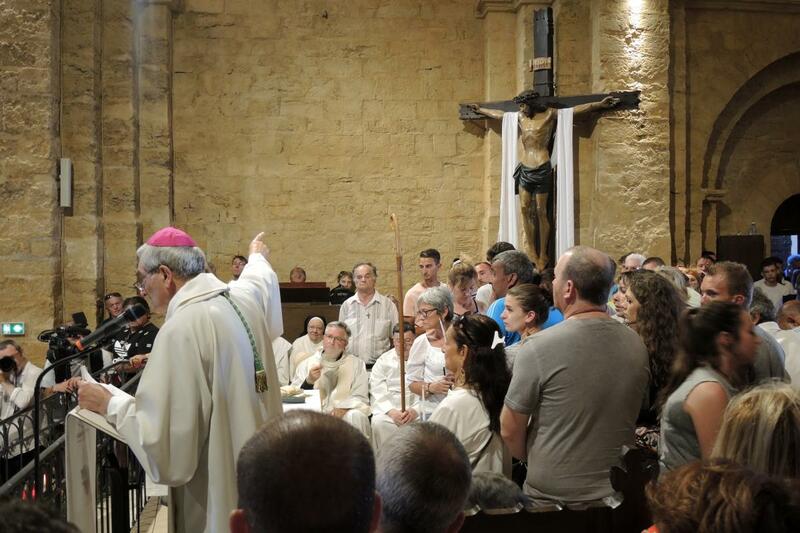 The archbishop of Aix-en-Provence and Arles officiated, and was joined by another bishop and a large number of priests. 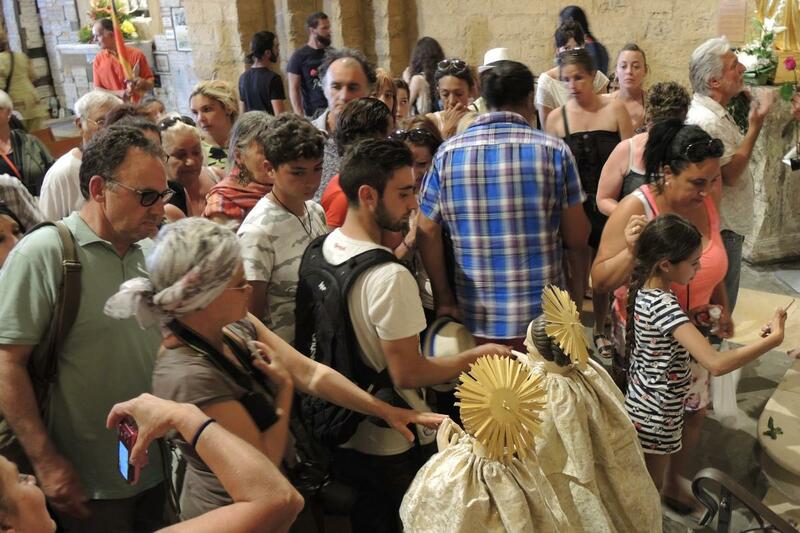 By 3:30 p.m. the church was over-full, and the plaza and streets outside were crowded as well, in anticipation of two of the major rituals of the week, the lowering of the reliquary of the Saintes Maries amidst a blaze of candles, and the procession of Ste. Sara that culminates in a frenzy on the beach. Sara’s statue had been brought up from the crypt to the nave of the church. A crowd of Gypsies stood around her, often touching her, but the focus of attention was still supposed to be (and for most part, was) towards the sanctuary and above it, where the painted wooden reliquary had been positioned for its descent from its year-round home above the altar. Dozens of Gens du Voyage and local parishioners were selected to join the clergy in the sanctuary of the church for the ceremony. 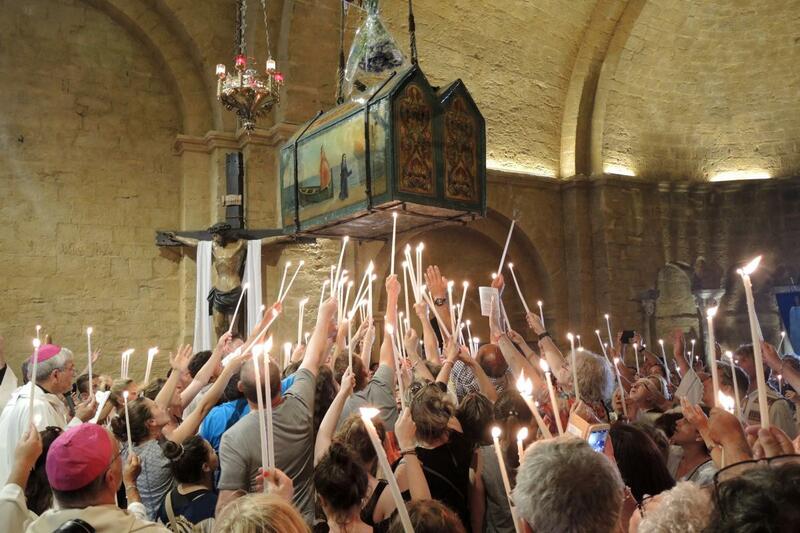 Between verses, worshippers shared cries of “Vivent les Saintes Maries! 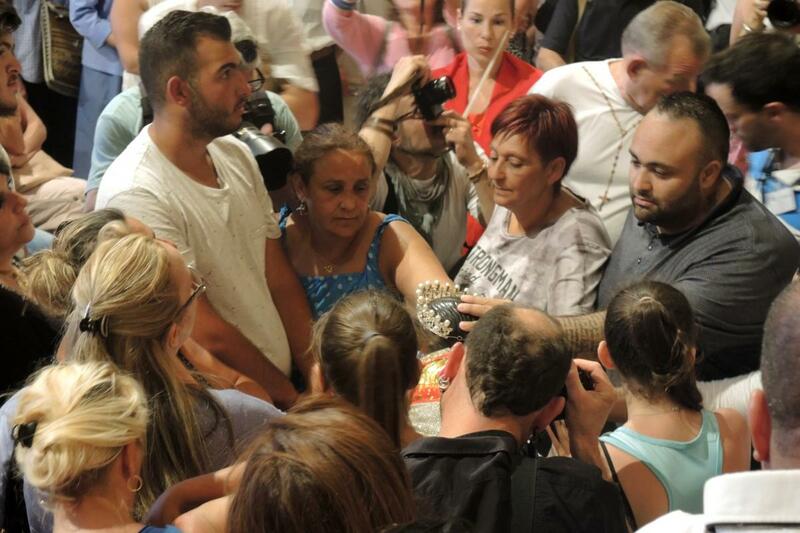 Vive Sainte Sara!” The reliquary came to rest on a large altar/table and devotees came up to linger a few moments in prayer and to touch the case. Even as many devotees continued to make their way to the reliquary, other people’s attention began to shift to the image of Ste. Sara, at the front of the nave of the church. Outside the church, a crowd waited for her statue to be brought out, wearing a sparkling tiara and laden under layers of ex voto cloaks. An honor guard of gardiens, the traditional cowboys who still work local farms, awaited on white horses to accompany Sara through the streets to the beach.6 The procession was comprised of Gens du Voyage, who carried the image, clergy, members of the confraternity of the Saintes Maries, and local people dressed in 19th-century regional Arlésienne costumes. They processed Sara's image through streets filled with devotees and tourists towards and then along the waterfront for a 1 km walk to the sea. 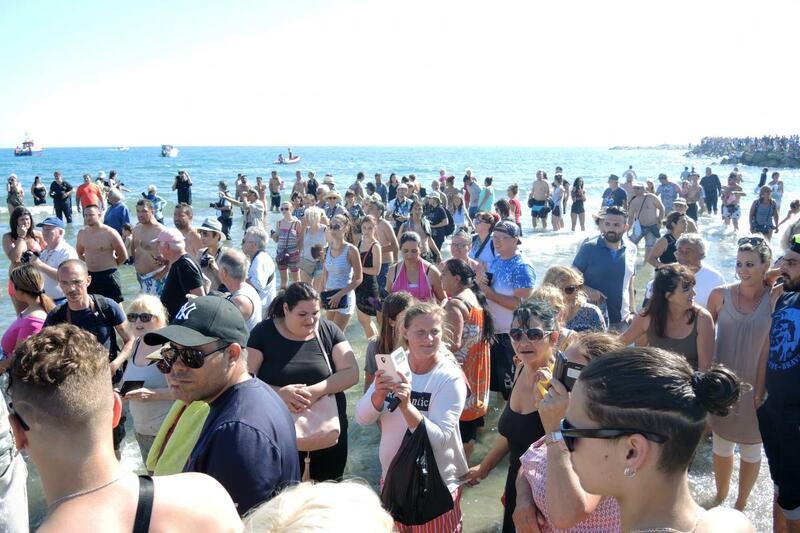 At the beach, a huge crowd awaited the procession’s arrival, waiting in the sand, on the stone jetties around the beach, and even in the water. The procession, henceforth very orderly, shifted into a lively revel. Gardiens on horses cleared the way to the sea to allow the bearers of the statue to continue into the shallow water, but devotees and celebrants jostled for position, sang, and took pictures. Her bearers entered the sea with Ste. Sara held aloft, as boisterous crowds celebrated, in a ritual part baptismal, part reenactment of the tradition of Sara greeting the pilgrims, and part simple celebration. Afterward, the procession then returned to the church and Sara was brought back down into the crypt. The reliquary of the Saintes Maries remained on the altar overnight. 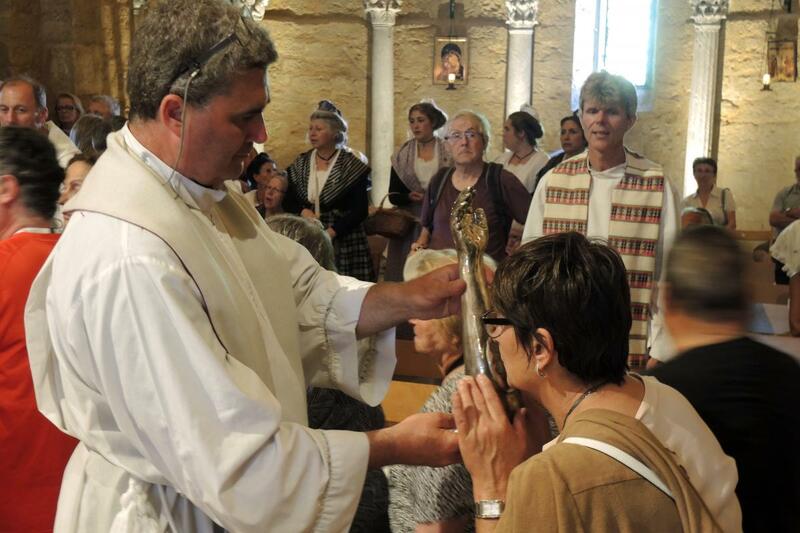 Events on May 25 began with two morning Masses in the church. 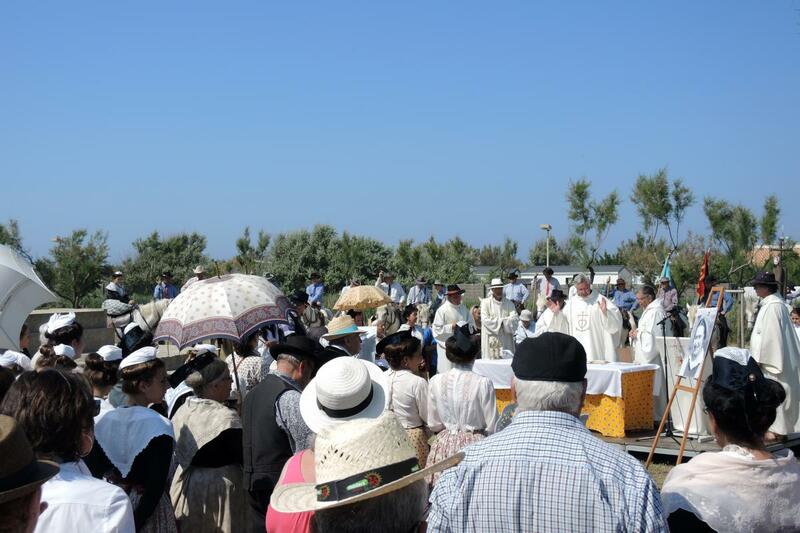 The 11 a.m. liturgy, celebrated by the archbishop with the reliquary behind him, was followed immediately by a second procession, the traditional procession of the Saintes Maries to the sea. 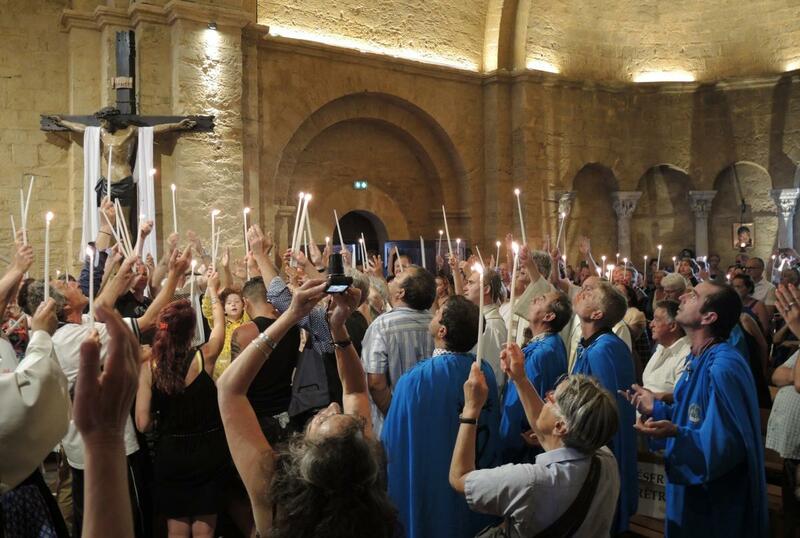 As the congregation sang Salut, Salut, O Saintes Maries, Hail, Hail O Holy Marys, punctuated by calls of “Vivent les Saintes Maries! Vive Sainte Sara!” church bells pealed. Members of the Gens du Voyage community again carried the statue out of the church, to be accompanied through the streets by devotees from the confraternity of the Saintes Maries, the clergy and others. 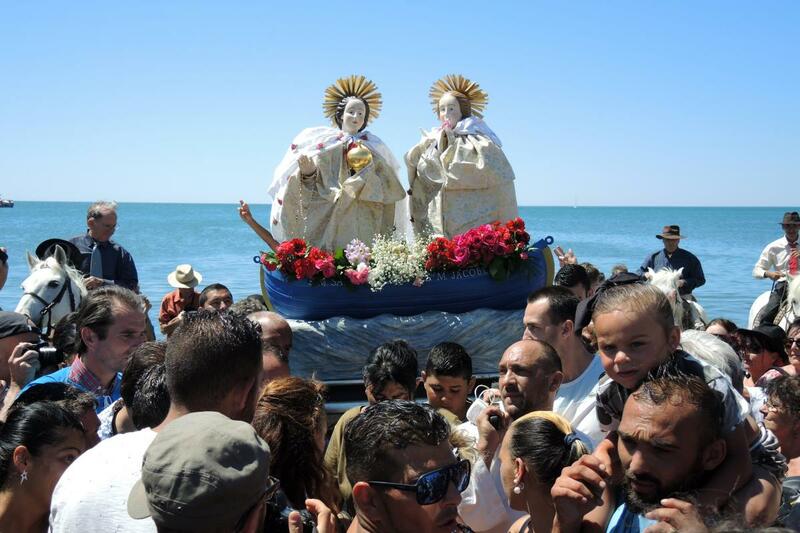 At the seaside, things were a little less raucous, but the processants again processed into the water, holding the images of the Saintes Maries in their boats above the water, while the crowd sang as they did in church. 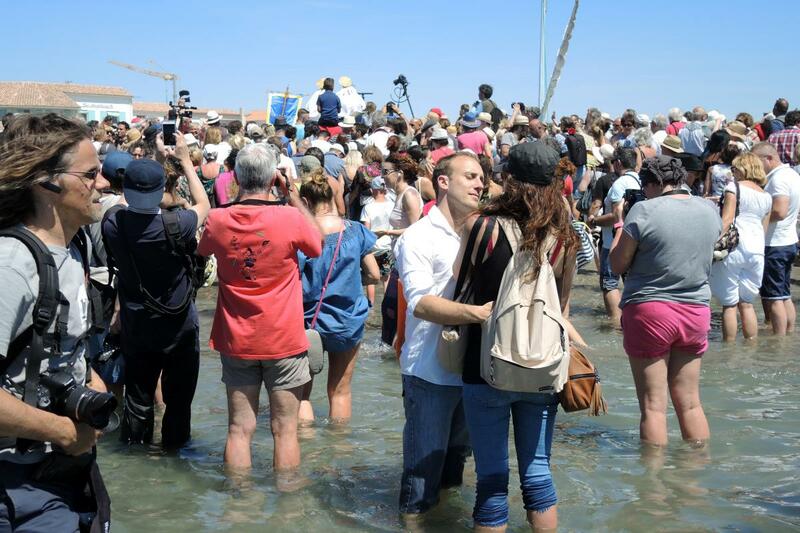 The archbishop stood in a boat just at the shore, presiding over the ritual reenactment of their arrival in France. From the water the Saintes Maries were carried back to the church to their home in the church and the arrival of the faith in France was reenacted. 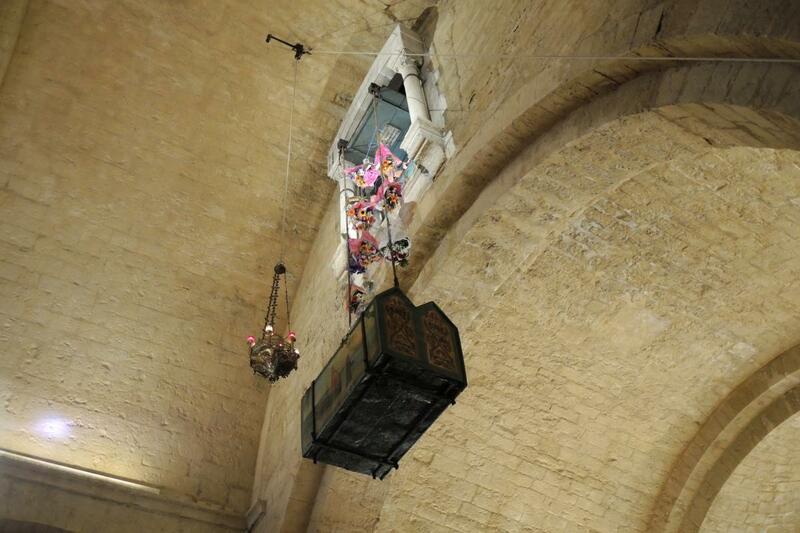 At 3:30 p.m., precisely 24 hours after it was lowered, the reliquary was raised once again to its perch above the altar. The families, mostly gypsies, who had donated bouquets to adorn the ropes came back to recover theirs (each was marked by name), and devotees picked up the capes they had offered to Sara to wear in the procession. These would be kept in their home or camper throughout the year, or perhaps distributed to family to keep. Like Catholics in many parts of the world, people wanted to be able bring home a physical remnant that carried some of the power of the feast. 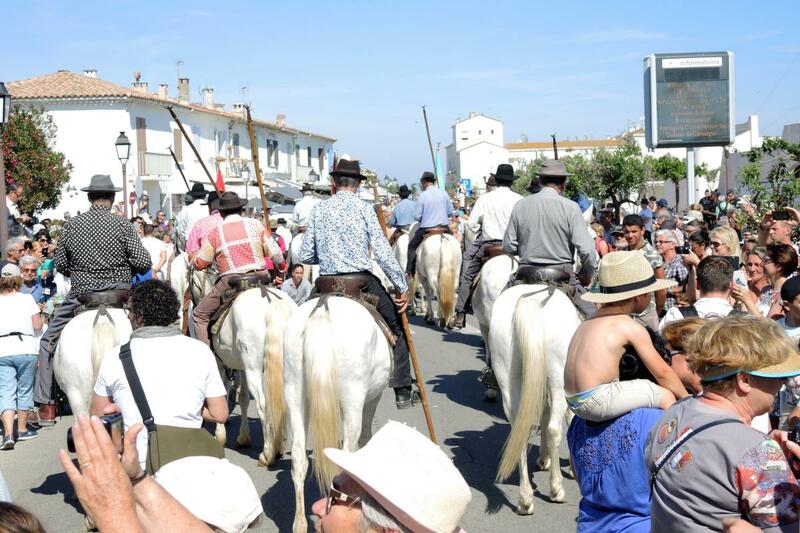 The final day, May 26, was dedicated to a series of cultural events linked to the pilgrimage, honoring the heritage of the Camargue. 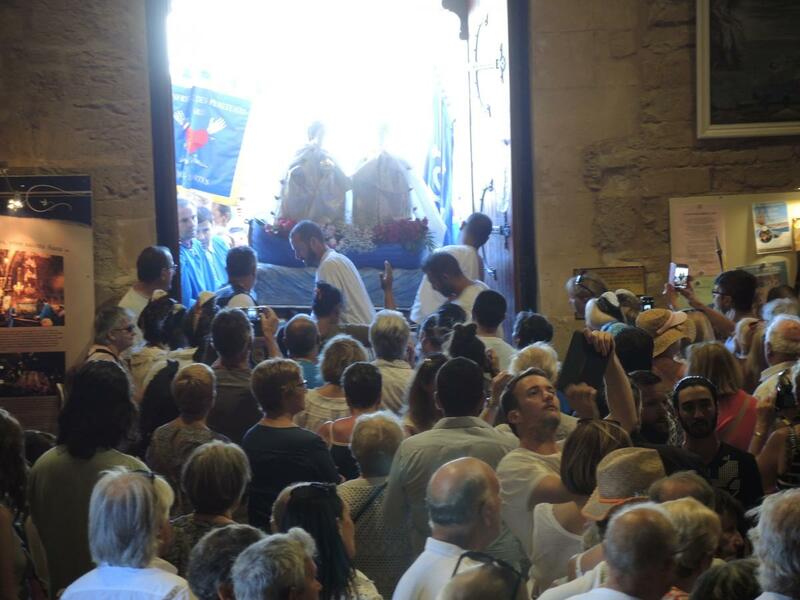 The only explicitly religious event was at noon, when locals gathered several kilometers west of town for an outdoor Mass at the tomb of the Marquis de Baroncelli. Attendees included gardiens on horseback and some people in antique Arlésienne costumes. Baroncelli was the figure who helped shape the 20th-century format of the pilgrimage to include the Gypsies and Ste. Sara, but Gypsy people were far less evident at this service, which is small in comparison to the prior days’ events. 1. Ste. Marie Jacobé’s feast is celebrated here May 25; Ste. Marie Salome’s feast is celebrated on the third Sunday of October. The Gypsy/Gens du Voyage community tends not to attend in significant numbers in October, and Ste. Sara is part of the celebration only in May. The church also celebrates a smaller, more local feast in early December to mark the anniversary of the reliquary’s placement above the altar. 3. 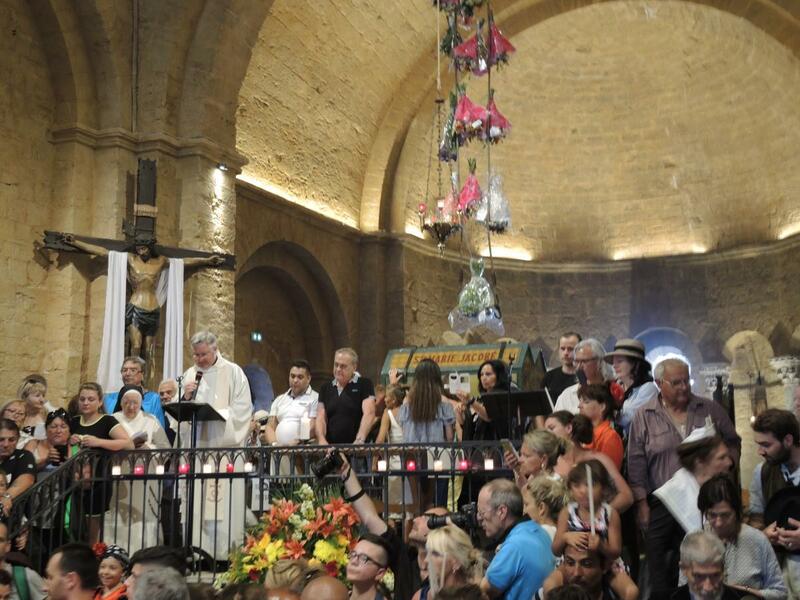 The account of the feast here is based on participant observation, including interviews with a half dozen pilgrim Gens du Voyage, and many of its organizers. Special thanks to Père Claude Dumas, head of the Aumônerie des Gitans et Gens du Voyage, and president of the Comité Catholique International pour les Tsiganes. A member by birth of the Tsigane community, he was kind to have brought me to meet many members of the community and to join them in their prayer, conversations, and entertainments. Thanks, too, to Martine Guillot, animatrice du sanctuaire of the parish church, for her particular help. 4. 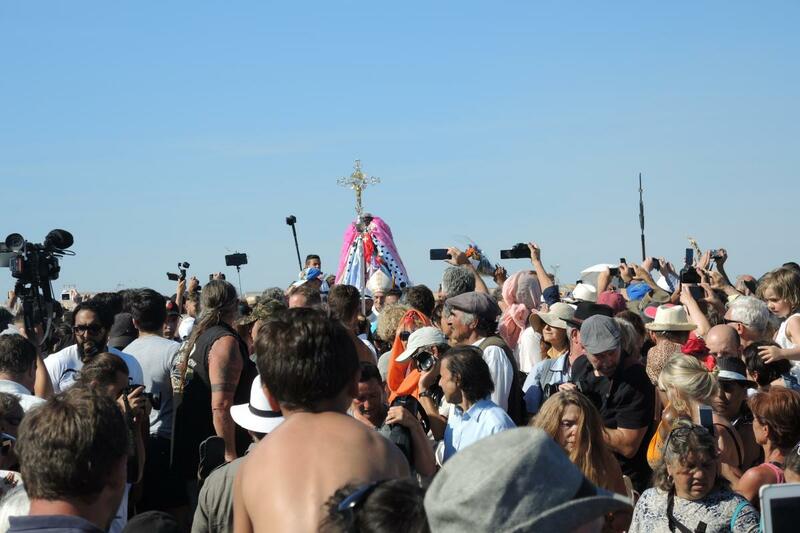 According to Ellen Badone “Pilgrimage, Tourism and the da Vinci Code at Les-Saintes-Maries-De-La-Mer, France,” Culture and Religion 9:1, March 2008,33, conflicts a decade or more prior to this visit had calmed the celebrations in those areas a great deal. 5. Notably, each bouquet was marked, and afterwards their donors came to collect them, often giving away flowers from the bouquet to friends, but thereby being able to take home an important memory of a gift given in honor of the saints that had somehow touched the saints. 6. The Marquis de Baroncelli, the lay Catholic who developed many of the rituals of the feast, was a gardien, and added this feature to the procession, among others.